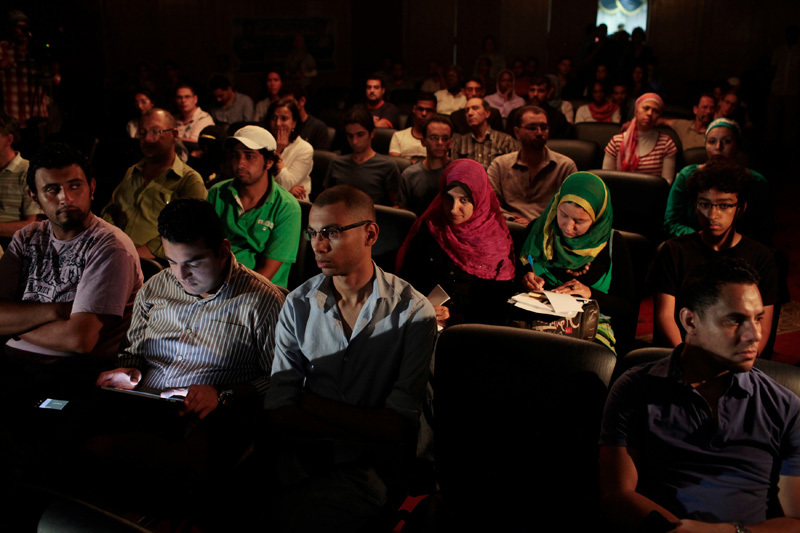 Nader El-Batrawi (left, lit by tablet), a 31-year-old activist lawyer with the group "No To Military Trials" Tweets on his iPad in the Journalists Syndicate during an event advocating the end of military rule and pushing the demands of the protesters in Cairo, Egypt June 26, 2011. When the Supreme Council of the Armed Forces took over as the transitional government after the resignation of President Hosni Mubarak on Feb. 11, it was greeted by many protesters as a protector of the revolution, whose demands for democracy it vowed to uphold. But since then, allegations of torture and the prosecution of civilians in closed-door military trials have tarnished its reputation and raised questions about its commitment to democratic rule.